Ice-Breaking LNG Carrier Vladimir Vize. Image by Mitsui O.S.K. Lines, Ltd. 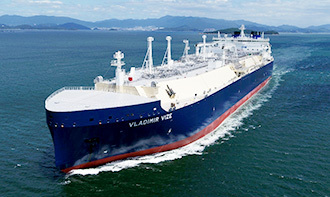 The Vessel Will Serve in the World's First Ice-Breaking LNG Carrier Project following "Vladimir Rusanov"
Mitsui O.S.K. Lines, Ltd. (MOL; President & CEO: Junichiro Ikeda) today announced that on 11 September, a naming ceremony for an ice-breaking LNG carrier, which was jointly ordered by MOL and China COSCO Shipping Corporation Limited (China COSCO Shipping), was held at Daewoo Shipbuilding & Marine Engineering Co., Ltd. (DSME). As a crowd of VIPs and personnel involved in the project looked on, the newbuilding vessel was named the "Vladimir Vize" by Ms. Irina Ershova of PAO Novatek, the major shareholder in the Yamal LNG project. The name "Vladimir Vize" was chosen in honor of the Russian Arctic explorer and oceanologist. The Vladimir Vize is the sister vessel of the "Vladimir Rusanov", which started transport service at the end of March 2018 under a long-term charter contract to transport LNG for the YAMAL LNG Project *1. 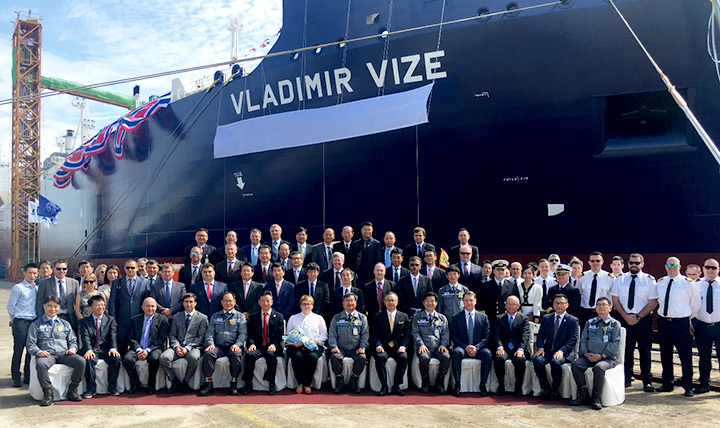 The Vladimir Vize is also scheduled to go into service for the Yamal LNG project following its delivery at the end of September in DSME and an ice-breaking navigation without ice-breaker support in the Northern Sea Route towards the Yamal LNG plant at Sabetta port in Russia. Construction of the last of the three newbuilding ice-breaking LNG vessels *2 has been progressing as planned in DSME, and the vessel is expected to be delivered to the Yamal LNG Project in the next year. Furthermore, regarding the four conventional LNG Carriers destined for the Yamal LNG Project announced in June 2017*3, construction to a high safety standard is proceeding with our project partner, China COSCO Shipping, using both internal and external supervisors. Construction of these four vessels is expected to be completed 2019-2020. The second train at the Yamal LNG plant started its operation in August 2018, and LNG production from the plant has been expanding steadily. MOL continues to work assiduously to ensure stable LNG transportation from the Yamal LNG plant, as well as for other energy resources and product transportation through the Northern Sea Route, where demand is expected to grow in the future. Naming ceremony on September 11. Image by Mitsui O.S.K. Lines, Ltd.
(9) Ship management company: MOL LNG Transport (Europe) Ltd.